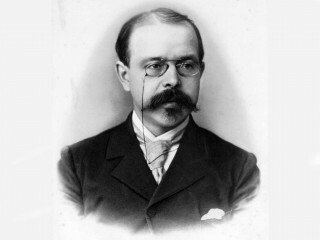 Walther Nernst born 1864-06-25 in Briesen, West Prussia was a German physical chemist and physicist who is known for his theories behind the calculation of chemical affinity as embodied in the third law of thermodynamics, for which he won the 1920 Nobel Prize in chemistry. He came to Göttingen from Leipzig (habilitation with Wilhelm Ostwald) in 1890 as private lecturer and assistant of Eduard Riecke at the physics institute. He was appointed extraordinary professor in 1891 and ordinary professor in 1894. He wrote a seminal textbook on physical chemistry ("Theoretische Chemie vom Standpunkte der Avogadroschen Regel und der Thermodynamik") whose first edition was printed 1893. In 1895 the physicochemical institute was founded, making use of an already existing building (Bürgerstr. 50), and Nernst was appointed its director. The inauguration ceremony took place 1896-06-02. Nernst invented a novel electric incandescent lamp based on solid-state electrolytes, and he was able to sell his patent (1897) in 1898 to the AEG (director Emil Rathenau) for a huge sum of which he donated 40000 Mark to enlarge the institute building. Research was performed predominantly in electrochemistry as well as on electric properties (dielectric constants) and on gas phase equilibria at very high temperatures. In 1905 Nernst was appointed director of the Berlin physicochemical institute. 1905-12-23 he reported the discovery of his Heat Theorem (Neuer Wärmesatz, Third Law of thermodynamics) at a meeting of the Königliche Gesellschaft der Wissenschaften (Royal Academy of Science) in Göttingen. Nernst initiated the seminal Solvay Congress in Brussels in 1911. Nernst was awarded the Nobel Prize in Chemistry 1920 "in recognition of his work in thermochemistry". In 1922 Nernst was appointed director of the Physikalisch-Technische Reichsanstalt (successor of Emil Warburg) until 1924 when he was appointed professor of physics at the university until his retirement in 1933. Nernst died 1941-11-18 at his country estate Rittergut Zibelle (Oberlausitz, near Muskau) at age 77. Later his mortal remains were transferred to the Göttingen municipal cemetery where they rest close to other celebrities of the science community. View the full website biography of Walther Nernst.